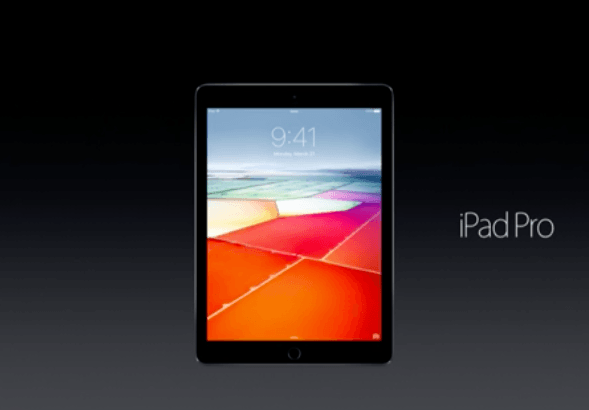 There’s now an iPad Pro with the same screen size as an iPad Air. At today’s event in Cupertino, Apple unveiled a smaller iPad Pro with a 9.7-inch screen and that weighs less than a pound. The company says that the goal was to bring the power of the iPad Pro to the 200 million iPad users that use a 9.7-inch iPad. The company also said most users who switched to an iPad Pro were actually Windows PC users (while also stating that over 600 millions PCs in use are over 5 years old). Apple claims the device has the lowest reflectivity of any tablet, while being 25 percent brighter than the iPad Air 2, at 500 nits – Apple is calling it the brightest tablet available. But perhaps the best aspect of the new screen is a new technology Apple is calling ‘TrueTone,’ which allows the screen to adjust its color temperature depending on where the iPad is being used. The technology is supposed to help the screen appear more natural and paper-like. While paper reflects the light around you and matches the color temperature of your environment, screens normally emit their own color temperature which can be jarringly in contrast to your environment. True Tone will allow the device to match the environment and thus make content look more realistic; it could be a huge boon for photographers, too. Internally, it’s largely similar to the larger iPad Pro. Four speakers around the edges? Apple Pencil support? Yup. A connector for a smaller Smart Keyboard? Absolutely. An A9x SoC powering it? Indeed. There’s an upgraded camera, however, matching the iPhone 6s for specs. There’s a 12 megapixel shooter with the ability to capture live photos and 63 megapixel panoramas. It can also shoot 4K video, although it doesn’t support optical image stabilization. The 9.7-inch iPad Pro will go on sale for $599 at 32GB, $749 for 128GB and $899 for 256GB – the first time that much storage has been offered on an iOS device. Oh, and this one comes in Apple’s four colors, including rose gold. The device will be available for pre-order on March 24, and will go on sale officially on March 31.